There’s nothing more comforting to this native New Mexican than a bowl of Green Chile and Cheddar Mashed Potatoes. Especially like today when the temp will be no higher than 10 degrees for the day. It’s frigid outside and I’m all about staying warm. 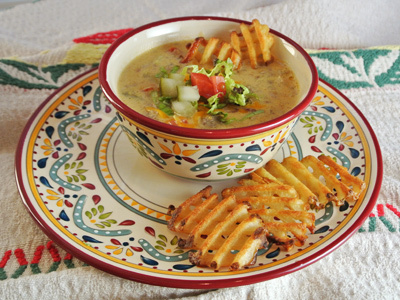 A bowl of comforting potatoes with spicy Hatch green chile and cheese is the perfect side dish or in my case main dish to serve on a blustery day like today! These mashed potatoes with buttery creamy melting cheese and green chiles are something that I make quite often. I love them soooo much!! Ask any member of my family and they will vouch for me that I have an infinite love of potatoes that goes way back. 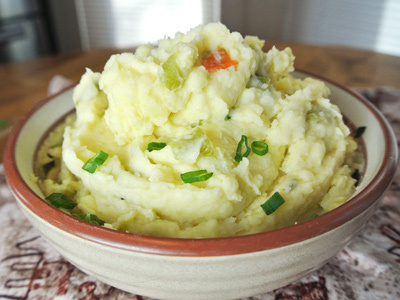 I had a hard time coming up with a recipe because I don’t measure when I make mashed potatoes, I just make them. So this time I did my best to put together something on paper that would help recreate the bowl of comfort that I’ve enjoyed so many times. I hope you will enjoy them as much as I have! Did you ever have a meal that reminded you of a special event, time or place? Do you recall a special dish you had on vacation or something you picked up at a vending cart at a festival? Or maybe you shared a meal with family and friends for a special occasion, such as a birthday or Christmas. About a month ago we celebrated Josh’s graduation from college. He’s a smart kid (I should say man), way smarter than his parents and we couldn’t be more proud! So after the pomp and circumstance we took him out to dinner at the Capital Grille down on the plaza. There were a lot of families celebrating and the wait staff couldn’t have been any nicer. Their menu was set up to order entrees and side dishes separately. We were feeling adventurous and ordered the Lobster Mac and Cheese as our side which we were told was a signature dish and favorite of the staff. The entrees were delicious, but the lobster mac and cheese was the true stand out. 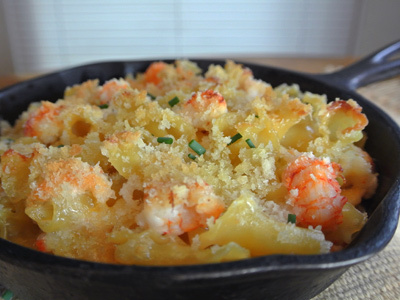 Served in a small cast iron skillet, the lobster was perfectly cooked with a light panko crunch in every bite while the blend of cheeses were so flavorful and creamy. It made such an impression that I started searching the web to see if there was a copycat recipe anywhere out there. I found a recipe I could work with and created a mac and cheese close to what we enjoyed at the Capital Grille. From now on this mac and cheese will be a reminder of the night we celebrated Josh’s graduation.